If it's metal, we'll straighten it! 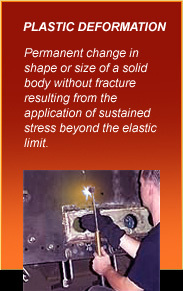 Introducing heat such as welding and other manufacturing processes will leave stresses in metals. Subsequent cooling will cause distortion and/or warping Precision Staightening is the art of returning metals to its desired shape. Tri-State's Precision Straightening is often the only option when compared to the cost of manufacturing new parts. Straightening is based on the physical principle that metals expand when heated and contract when cooled. By restricting expansion of a rapidly heated and well defined section of a workpiece, the resulting tensions are in the plastic deformation range. Controlled cooling contracts the metal more than it could expand when heated and, if performed correctly, will straighten out existing distortions. The Precision Straightening process result depends highly on how quick working temperature is reached and how small the heated area is. These are just a few reasons why Precision Straightening is an art form. Call the artisans at Tri-State Flame Hardening Company today for all your straightening needs!